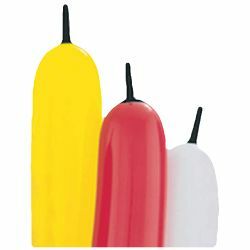 These are Qualatex bee body balloons Q321. They come in a package of 100 balloons in assorted colors that consists of yellow, red, and white. All the colors have black tips. These balloons can be used to make bees, insects, and apples as well as a wide range of other balloon sculptures.